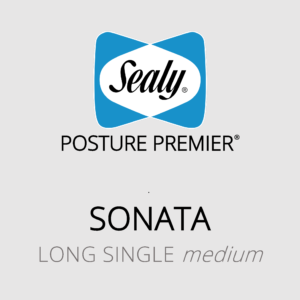 The Sealy Posture Premier (Sonata) long single mattress with medium feel has superior features, quality and durability. Featuring a Gel Centre, PostureTech ST springs and UniKey® Edge Support. The Sealy Posture Premier (Sonata) double mattress with medium feel has superior features, quality and durability. Featuring a Gel Centre, PostureTech ST springs and UniKey® Edge Support. The Sealy Posture Premier (Sonata) queen mattress with medium feel has superior features, quality and durability. Featuring a Gel Centre, PostureTech ST springs and UniKey® Edge Support. The Sealy Posture Premier (Sonata) king mattress with medium feel has superior features, quality and durability. Featuring a Gel Centre, PostureTech ST springs and UniKey® Edge Support.